In what is becoming a bit of a trend in Africa for me, my guide was about half my height. He stood in front of my and talked in a serious voice. Of course, I had my doubts. I’ve seen these types of “sacred” animals all over the world. What often happens is that a village realizes that tourists will come if the animals are around, so they do all they can to make sure the animals are there. 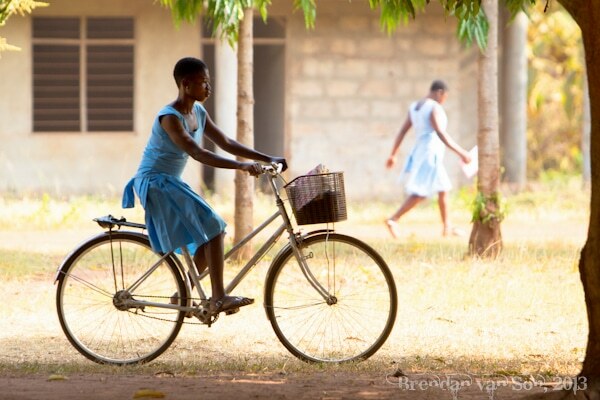 In the village of Boabeng-Fiema, Ghana, I imagined it to be much of the same. And even as I saw the dozens of monkeys racing all over the village I couldn’t help but believe that the people simply feed the monkeys so that they around. However, as the guide told the story of the monkeys of Boabeng-Fiema I was quickly convinced that there is something else at play. The tale my frail height-challenged guide told was quite interesting, and shows the superstition so many Africans live under in various parts of the continent. It is said that a hunter went off into the forest in search of a catch when he came across a troop of monkeys surrounding a fetish. Intrigued by the fetish, the hunter brought it back to the village with him. To his surprise, all the monkeys followed. A shaman was consulted to help understand the connection between the fetish, the monkeys, and the village. The shaman came to the obvious conclusion that the monkeys were tied to the fetish. However, it seemed that the connection was much more powerful. A villager is said to have attacked a monkey and caused it harm. Following the incident, the same type of attack was laid on the attacker. It was then said that any harm done to the monkeys would result in a similar harm being done to the person. Thus, a person that kills a monkey will soon die as well. Or a person who chases a monkey from the village will soon be chased from the village themselves, and so on. It was decided by the shaman that if the people wanted the monkeys around they could keep the fetish in the village, but never harm one. 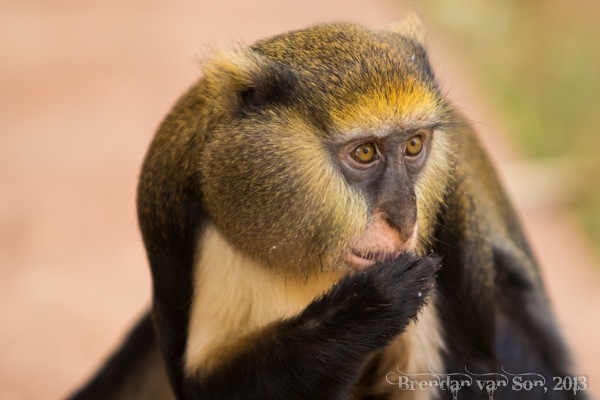 At some point, if they decided that they didn’t want the monkeys anymore then they could return the fetish to the forest and thus ridding themselves of their primate friends. But they believed that the monkey and the fetish were good luck and thus decided to keep both. 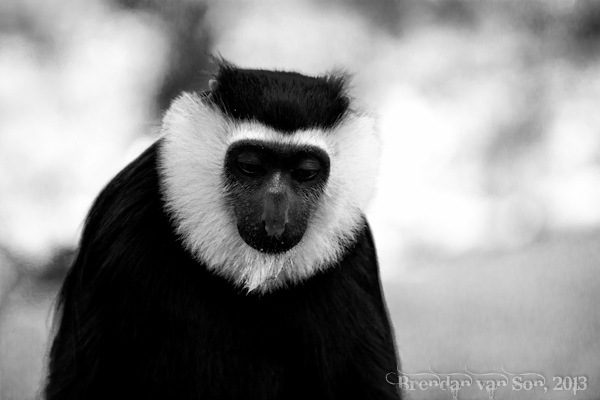 To this day, both Mona and Black & White Colobus Monkeys run wild through the villages. They steal maize from the farmers, sneak into kitchens, and sit on benches eating stolen cashews. But the villagers will never chase the monkeys away, they’ll never yell at a monkey, and they’ll certainly never lay an abusive hand on one. In fact, the monkeys are so revered in Boabeng-Fiema that there is even a cemetery just outside the village where people have buried those who have died. According to my guide, the monkeys don’t ever die in the forest, they come to the village to die so that someone will find them and give them a proper burial. Now, whether or not you believe the monkeys of Boabeng-Fiema to be sacred or a part of a tale told by elders is obviously debateable. 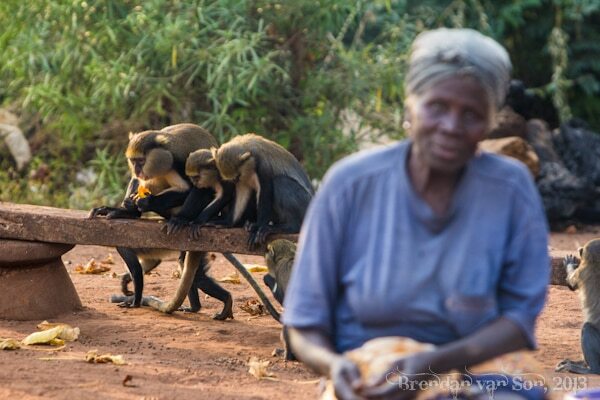 And although I’m sure that you’ll find the gross domestication of the monkeys to be more than just a little bit disturbing, It’s hard not to feel a little bit intrigued by the relationship between man and monkey in this village in the heart of Ghana. And although the curious hand wonders, I wouldn’t dare lay a malicious hand on a monkey in Boabeng-Fiema. What a wonderful story and as an animal lover, one that does not have pets but extended family members. I do not dress them up to be little people but love them and respect them for who and what they are. They have jobs and responsibilities like everyone else in the family and in return there is a lot of love. What I think they have found in this little village is respect! And I am sure the villagers have learned much more from their monkey neighbours then they learn from the villagers. The hard lessons like tolerance, patience and respect. So in a way I guess you can say the monkeys are sacred seeing how they have taught a people lessons the bible has been trying to teach for 2000 years but did it in one generation. Very touching story and beautiful colorful photos. 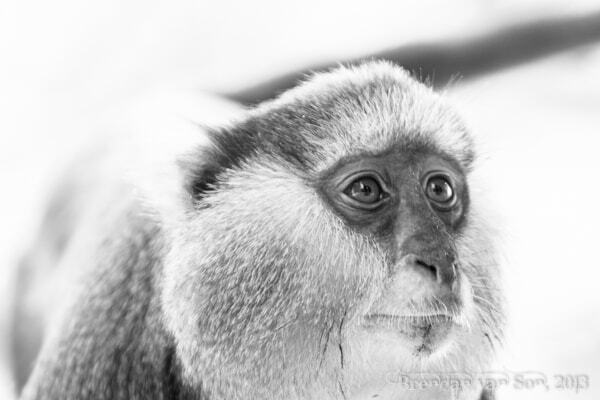 Particularly impressed by the monkey on 4 photo, a very sad sight. And do not harm nature. What a great story. Sounds like the village really is in tune with their primate residents. We could all learn something from this. I love hearing of such stories, whether true or not. That is what makes travel so magical. Monkeys sure do seem to get a lot of support all around the world and in particular Hindu countries. For different reasons obviously, but always fascinating. Great photos too. What an interesting story! And I looove your photos! Great photos. I love meeting different things than already experienced. Great post! I really like superstitious stories and beliefs. no doubt this is a very interesting subject, I believe that apes deserve respect and importance. Great! 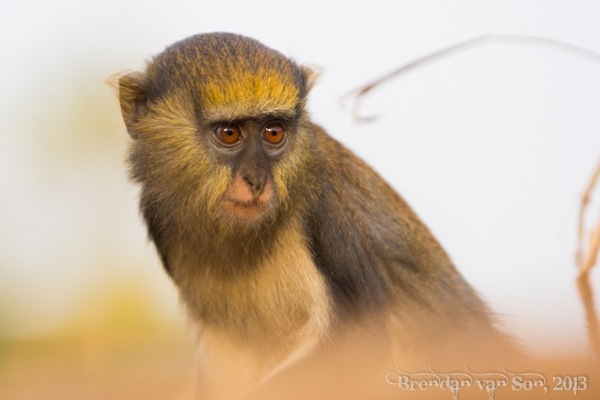 The monkeys at Boabeng-Fiema look brilliant! Would love to go to Ghana. They can ‘Sing’ & Dance, sometimes their Face use a woman’s mask.. Thanks for Your amazing info here.. Thanks for the writings. Headed to Ghana soon and I think Boabeng is now on the list. Sweet! You’ll like it, I think. 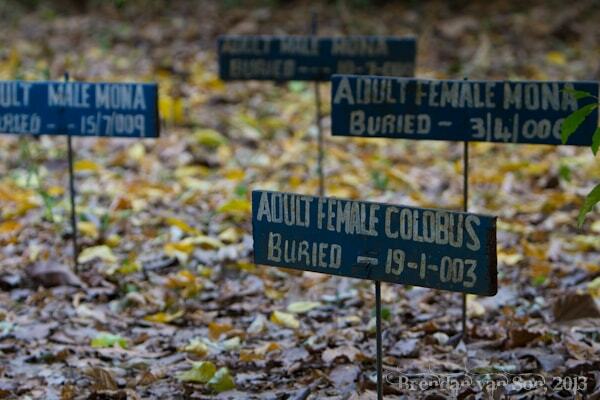 Few places can you get closer to these types of monkeys, especially the colobus which are normally really shy. good villagers will never chase the monkeys away, they’ll never yell at a monkey, and they’ll certainly never lay an abusive hand on one. Save the animal, because animal have a soul like the human. I like this article..
I’m going to make you dance on the street to make me money, you piece of meat. I love hearing of such stories, whether true or not. That is what makes travel so magical. Monkeys sure do seem to get a lot of support all around the world and in particular Hindu countries. Nice adventure, and wonderful picture Brendan, really also with your video and good picture. I like it. Nice shoot in every angle. Good picture, nice article, and great adventure!